Voice of San Diego begins an exploration into city street light policies. Frank Gomez travels around San Diego every day as a building inspector, admiring the good homes in good neighborhoods, often in the city’s northern half. When day turns to evening, Gomez returns to his house in Encanto, where the difference between his neighborhood and others can feel like, well, night and day. At night, it’s dark around Gomez’s home, though he lives close to one of Encanto’s main commercial areas. Many streets in San Diego’s southeastern neighborhoods share the same story. Gomez believes the darkness breeds vandalism and gang activity, some of the area’s most persistent problems. A solution, Gomez believes, is simple: more street lights. Gomez’s concerns highlight the next issue I’m going to be tracking, San Diego’s policies for street lights. I plan to examine the relationship between street lights and crime and economic development and why they exist or don’t in certain neighborhoods. Besides folks in southeastern neighborhoods, City Heights residents, for instance, have long been frustrated with the lack of street lights in their community. I hope to tell stories about street lights in many different ways, beginning with a map. Below is San Diego illuminated through the density of street lights. The orange and yellow areas show the brightest parts of the city and blue, the darkest. The extremes aren’t surprising. The light glows in downtown, and around popular night spots in Pacific Beach, Hillcrest and North Park and ebbs in more rural areas, such as San Pasqual, Otay Mesa and Pacific Highlands Ranch. Distinctions between other neighborhoods are less obvious. But Eric Busboom, who compiled the street light information for his open government resource, the San Diego Regional Data Library, was able to break down the data by community planning group area, which roughly approximate city neighborhood boundaries. 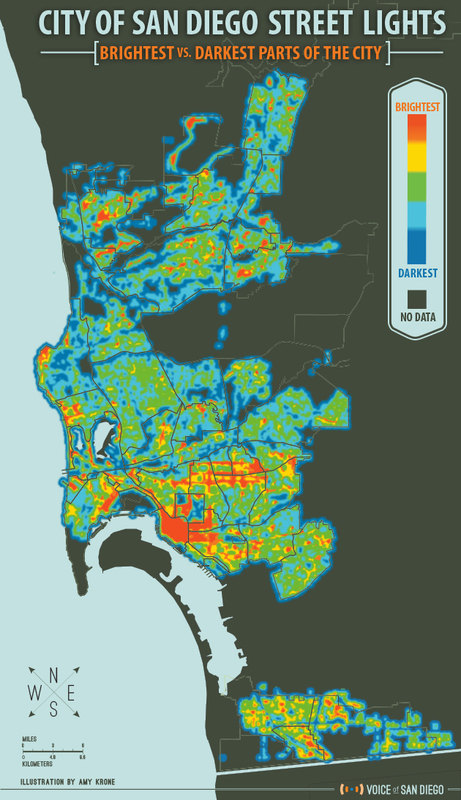 According to Busboom’s analysis, the greater North Park area has more than a third higher street light density than Gomez’s Encanto neighborhood. Busboom plans to finish a project correlating crimes like car thefts and break-ins to street light density in the next few weeks. “We want to get people to understand issues in terms of their neighborhood right around them,” Busboom said. We created a Google spreadsheet of Busboom’s street light analysis, which shows the number and density of street lights by planning area. (You can find a map of planning areas here.) The data isn’t perfect for comparisons because it doesn’t distinguish between commercial, residential, industrial and nature preserves in neighborhoods. The Navajo area in eastern San Diego, for instance, has a low street light density, but it includes Cowles Mountain and Mission Trails Regional Park. What do you want to know about street lights in San Diego? You can email me (liam@vosd.org), contact me on Twitter (@dillonliam) or call me (619-550-5663). Liam Dillon is a news reporter for Voice of San Diego. He covers how regular people interact with local government. What should he write about next?